Purpose: To use spectral domain optical coherence tomography (OCT) to assess the features of the inner and outer layers of the macula in subjects with retinitis pigmentosa (RP). Design: Prospective observational comparative study. Materials and Methods: Subjects with RP with reduced central visual acuity and central macular thinning (RP group) underwent spectral domain OCT evaluation along with age-matched healthy control subjects (control group). 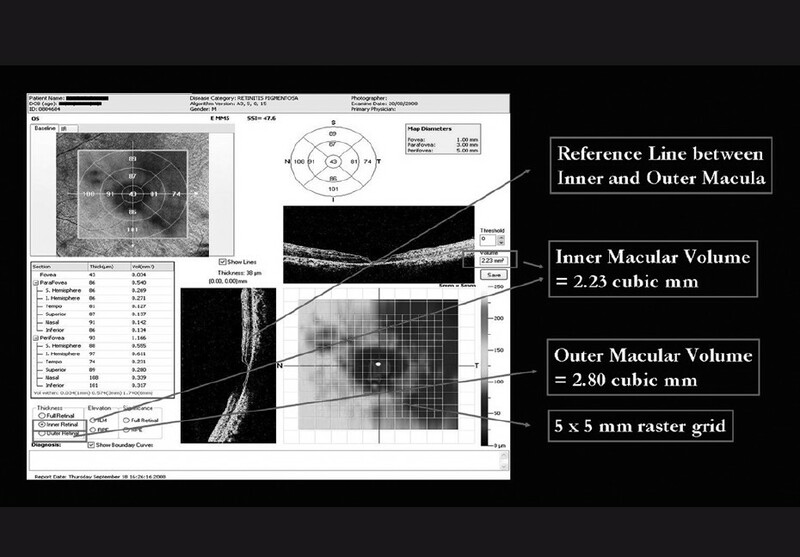 Using the E-MM5 raster protocol, a 5 × 5 mm central macular cut was acquired with inner and outer macular volumes serving as the primary outcome measures. A structural analysis of the inner and outer retinal layers at the macula in the RP group was also performed using the HD cross-line protocol. Results: The RP group comprised six eyes of six RP subjects and control group comprised six eyes of six control subjects. The outer macular volume was significantly lower (P<0.05) in the RP group (2.01±0.44 mm  ) compared to the control group (4.68±0.16 mm  ). There was no difference in the mean inner macular volume between the RP group (2.46±0.24 mm  ) and the control group (2.55±0.22 mm  ). No significant structural alteration was noted in the inner retinal layers of the RP group. There was no significant correlation (r = -0.04, P>0.05) between best-corrected visual acuity and outer macular volume in the RP group. Conclusions: Spectral domain OCT findings confirm that RP preferentially affects the outer retinal layers in the macula. 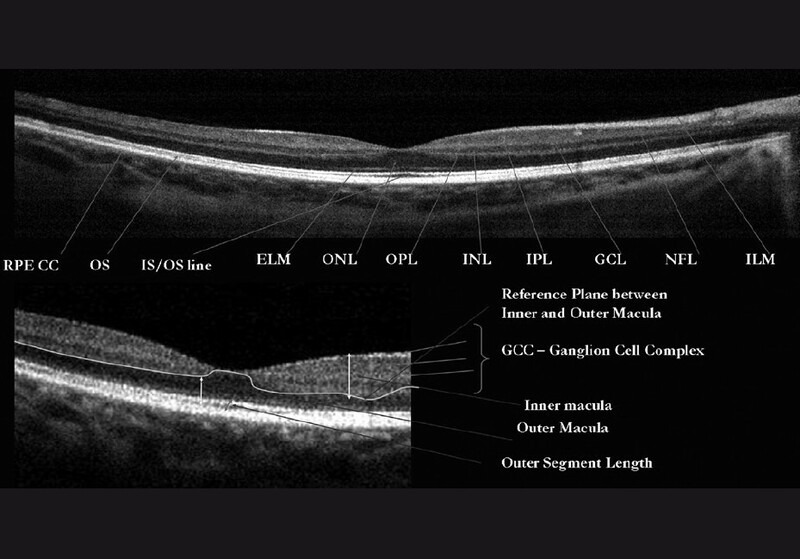 Although the number of patients included in this study was small, it demonstrated relatively well-preserved volume and morphology of the inner retinal layers using spectral domain OCT.
Optical coherence tomography (OCT) is a well-recognized method of determining retinal architecture and is an accurate method of measuring retinal thickness. , Time domain OCT has been used to evaluate RP maculopathy and studies have shown that patients with RP with visual acuity worse than 20/200 have demonstrated central macular thinning or CME on OCT examination. , Investigators have reported that selective alterations in the structural integrity of the outer retinal layers of the macula with central outer retinal thinning on spectral domain and ultra-high resolution OCT correlates clinically with visual acuity in patients with RP. , The inner retinal layers features in terms of morphology and thickness in RP patients have not been clearly elucidated, neither has the relationship between the outer and the inner retinal layers, especially in RP cohorts with reduced central visual acuity and central macular thinning. In this study, we compare the volumes and the morphological alterations of the inner and outer retinal layers of the macula on spectral domain OCT in RP subjects with decreased central visual acuity and central macular thinning to healthy matched controls. The institutional review board approved this observational comparative cross-sectional study performed at a single center (AJEH) between August 2008 and January 2009. Written informed consent that met the tenets of the declaration of Helsinki was obtained from all subjects in the study prior to OCT imaging. Subjects with RP with reduced central visual acuity and central macular thinning (RP group) underwent measurement with spectral domain OCT and were compared to age-matched healthy control subjects (control group). The best-corrected visual acuity (BCVA) was 20/200 or worse measured with the Snellen acuity chart. Central foveal thickness (CFT) was less than 100 microns on spectral domain OCT HD cross-line protocol. Subjects were at least 18 years old. The best-corrected visual acuity (BCVA) was 20/30 or better measured with the Snellen acuity chart. Prior history or current evidence of glaucoma or optic neuropathy. Prior history of ocular trauma, intraocular surgery or laser therapy. Refractive error greater than +6.00 D or less than −6.00 D.
Media opacity that precluded quality OCT image capture. Using the E-MM5 raster protocol and HD cross-line protocol of the RTVue (Optovue Inc., California, USA) spectral domain OCT, a 5 × 5 mm cut of the central macula and vertical and horizontal line sections through the fovea were acquired for each eye through a dilated pupil. OCT images were converted to grayscale for better contrast of the individual layers. The reference line, pre-selected by the computer software, was used as the demarcation between the outer and inner retina on grayscale images. The ganglion cell complex (GCC) comprising the inner plexiform, ganglion cell, and nerve fiber layers was compared between groups for structural integrity using the HD cross-line protocol [Figure 1]. Retinal volume was measured by the area covered under the 5 × 5 mm cut. The primary outcome measure was the RTVue inner and outer macular volumes of both groups. Statistical analysis was performed using computer software (StatXact-4, Cytel Software, Cambridge, MA). The means were compared using the unpaired T-test, and correlations were calculated with the Pearson correlation coefficient. All tests were two-tailed with a statistically significant P value less than 0.05. Six eyes of six RP patients comprised the RP group and six eyes of six healthy patients comprised the control group. The mean age was 45 years in the RP group and 46.83 years in the control group (P<0.05). The mean BCVA was 1.15 ± 0.14 (log MAR ± SD) in the RP group and 0.0 in the control group. The outer macular volume was 2.01 ± 0.44 (mm  ± SD) in the RP group and 4.68 ± 0.16 (mm  ± SD) in the control group. The inner macular volume was 2.46 ± 0.24 (mm  ± SD) in the RP group and 2.55 ± 0.22 (mm  ± SD) in the control group. The outer macular volume was significantly lower in the RP group when compared to controls (2.6, 2.17 - 2.99, P<0.05). There was no difference in the inner macular volume between groups (-0.09, -0.38 - 0.2, P>0.05) [Table 1] and [Table 2], [Figure 2]. There was no significant correlation (r=-0.04, P>0.05) between BCVA and outer macular volume in the RP group. The layers of the GCC were distinct in both study and control groups. The inner segment/outer segment (IS/OS) junction and external limiting membrane (ELM) were disorganized in all RP patients when compared to controls. Histopathologic studies demonstrate photoreceptor layer disruption/shortening in most cases of RP. , This finding has been further corroborated by in vivo spectral domain or ultra-high resolution OCT studies of the retina. Witkin et al.,  noted significant photoreceptor layer shortening in RP cases compared to matched controls, while the same difference was not noted between their CFTs. Our study supports this observation, in that all eyes with RP had significantly reduced outer macular volumes compared to age-matched controls, while the same difference was not noted in the inner macular volumes. Additionally, inner retinal layer morphology at the macula was well-preserved. This preferential change of the outer retina with relative preservation of the inner retina, at least structurally, could help determine the level of intervention in the order of the neuronal pathways with regards to impulse generation and transmission by artificial means. Aizawa et al.,  categorized the inner segment/outer segment (IS/OS) junction on spectral domain OCT into three grades according to the clarity of the demarcation line. They found a significant correlation between IS/OS junction grade and BCVA as well as CFT, suggesting that BCVA and CFT was significantly better in RP eyes with distinct, highly reflective IS/OS junctions. Witkin et al.,  noted excellent correlation between BCVA and photoreceptor layer shortening in RP eyes. Our study did not register a significant correlation between BCVA and outer macular volume. Perhaps a small sample size with selective inclusion of RP cases with reduced central visual acuity and central macular thinning could have accounted for the above. Nevertheless, a statistically significant difference in the outer macular volumes between the study and control groups was measured, and this was the primary aim of our study. Another weakness of this study besides the small number of cases involved is the fact that the variability of measuring the inner and outer retina in RP patients by the automated segmentation technique is not currently known. In conclusion, the spectral domain OCT findings in this study indicate that RP is a disease preferentially affecting the outer retinal layers. The RP cases included in this study demonstrated relatively well-preserved volume and morphology of the inner retinal layers on spectral domain OCT.
1. Pagon RA. Retinitis pigmentosa. Surv Ophthalmol 1988;33:137-77. 2. Hee MR, Izatt JA, Swanson EA, Huang D, Schuman JS, Lin CP, et al. Optical coherence tomography of the human retina. Arch Ophthalmol 1995;113:325-32. 3. Puliafito CA, Hee MR, Lin CP, Reichel E, Schuman JS, Duker JS, et al. Imaging of macular diseases with optical coherence tomography. Ophthalmology 1995;102:217-29. 4. Hirakawa H, Iijima H, Gohdo T, Tsukahara S. Optical coherence tomography of cystoid macular edema associated with retinitis pigmentosa. Am J Ophthalmol 1999;128:185-91. 5. Grigoropoulos VG, Emfietzoglou J, Nikolaidis P, Chatzistefanou K, Vergados J, Theodossiadis GP, et al. Optical coherence tomography findings in patients with retinitis pigmentosa and low visual acuity. Ophthalmic Surg Lasers Imaging 2010;41:35-9. 6. Aizawa S, Mitamura Y, Baba T, Hagiwara A, Ogata K, Yamamoto S. Correlation between visual function and photoreceptor inner/outer segment junction in patients with retinitis pigmentosa. Eye (Lond) 2009;23:304-8. 7. Witkin AJ, Ko TH, Fujimoto JG, Chan A, Drexler W, Schuman JS, et al. Ultra-high resolution optical coherence tomography assessment of photoreceptors in retinitis pigmentosa and related diseases. Am J Ophthalmol 2006;142:945-52. 8. Berson EL. Retinitis pigmentosa. Invest Ophthalmol Vis Sci 1993;34:1659-76. 9. Ferris FL 3 rd , Kassoff A, Bresnick GH, Bailey I. New visual acuity charts for clinical research. Am J Ophthalmol 1982;94:91-6. 10. Milam AH, Li ZY, Fariss RN. Histopathology of the human retina in retinitis pigmentosa. Prog Retin Eye Res 1998;17:175-205. 11. Stone JL, Barlow WE, Humayun MS. Morphometric analysis of macular photoreceptors and ganglion cells in retinas with retinitis pigmentosa. Arch Ophthalmol 1992;110:1634-9.